Did you know… the bee you see on top of this page is drawn with Excel using shapes? Dear Excel 2016, you have made so many enhancements that help me a lot in work… but why you took away my favorite Pinned Folder by giving me a half page of white space? My workplace just got upgrade to Office 2016 from 2010 (it’s a big jump although it is not yet reaching to the latest version). I guess I am the only one in the office who is feeling excited and happy about the upgrade. Nevertheless, I could not find my farovite Pinned Folder… which I used to have in Excel 2010… as well as Excel 365 (which I use at home). Googled a bit and realized that the Pinned Folder is not available in Office 2016 for whatever reason. Have you ever had an Excel moment like this? Then you should spend a few hours in the coming days to watch the webinars (Yes, I recommend you to watch all the webinars) by Mynda. 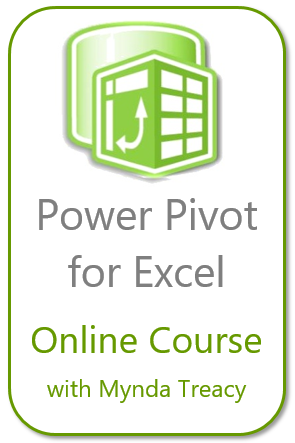 You will find the time worthy spent as you will learn many time-saver techniques in using Excel; and also Power BI. If you’re not sure what a dashboard is, or how these skills might be relevant to you, and help you overcome the challenges above, then you can attend one or both of Mynda’s FREE Excel Dashboard Webinars. Feel free to share this to your friends and colleagues and invite them to attend Mynda’s free Dashboard webinar too. They’ll thank you for it. Plus Mynda personally provides support for the first 6 weeks of the 12 month membership. By the way, the 6 weeks of personal support is the reason the course is only open for a limited time (registration closes Nov 15). Mynda limits the number of classes to allow time for other projects and a break every now and again. That’s not to say she won’t support you after the first 6 weeks, it’s just that it might take her a few days or a week to reply to you if she’s out of town or busy working on another course etc. The previous classes have been a huge hit with many people saying how they love the cool techniques and how they’ve been able to impress their colleagues and clients by using them in all sorts of reports, not just dashboards. “An excellent course, Mynda. You have the gift of making the complex simple to understand. I thoroughly enjoyed your teaching. I have applied nearly everything taught. “This was my first online training course and I was a bit dubious about how much I was going to learn. I have to say, minute for minute I have learnt more on this course than any other course I have been on. The way the course is delivered is exceptional and the learning material and exercises really cement the learning. This course has without a doubt furthered my career and has allowed me to secure a permanent job based on the skills I have acquired from this course. I have already signed up to another course! You can read further comments from past students and find out more here. If you register by Thursday, Nov 8 it’s 20% off . So, do yourself a favour and check out the course. The course is awesome and it’ll transform your Excel reports and possibly even your Excel career. Please join me to welcome our special guest – Jack Skellington, appears on wmfexcel’s Excel sheet. Have you heard of the new Dynamic Array functions recently available in Excel 365 (currently for Insider Fast users only)? If you are an advanced Excel user, you will be impressed by these new functions. They are simply awesome, super powerful and have lots of potential to solve “used-to-be” complicated problems in Excel with ease. I watched a few videos from my favourite YouTube channels, and learned something new (to me). Probably you think I learned some cool new features of Excel 365. Yes I did. Although the new features are really impressive, they are not as much as surprising than a simple trick I learned from a video in Excelisfun. How to add worksheet background in #Excel? So in a recent in-house training, I’ve prepared a special Sheet1 in the working file. Like the one above. Guess what, many participants asked instantly how to make that. Note: This is not an Excel post. I went to a very remote village called YuBeng in Yunnan, China. It’s a village 3200M above sea level. To get to there wasn’t easy. Not to mention the traveling time on flight, coach, minibus, and mini mini bus… the real challenge was the final part of the journey – a six-hour hike on high altitude. You know what, two-third of the trail was uphill. And I was carrying my backpack weighted about 10kg. Like learning Excel, no pain no gain. Notwithstanding all the sweats and efforts, the result (scenery) pays off. Some photos to share. Have you heard about the Excel Hash competition? It is a contest initiated by Oz du Soleil at Excel On Fire. 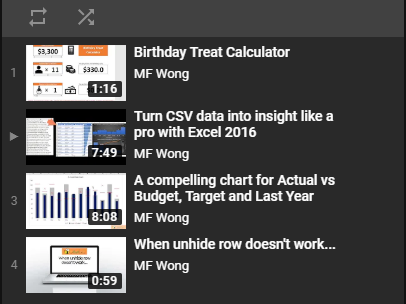 Six well-known Excel MVPs, including Oz himself, show you what they can do with four designated Excel features/functions, and more importantly – how, on their YouTube channels. MAX Function – A basic function, well… you think it is? As you know, the true power of Excel never comes from a standalone function or feature. It comes from the ability of mixing function/feature together to do something great and impressive. Of course it requires out-of-the-box thinking from the people who use it. You will know what I am talking about after watching the six entries below. Last week, I told you that my Surface Pro 4 is out of service, and I am waiting for a new laptop for writing my Excel blog… until late September or early October. That was the plan. That was the moment. Yeah… Why don’t I share something cool! Even though I am not using Excel 365, it’s good to know what’s new and keep updated. On top of my mind is to buy a New Surface Pro. Indeed, I like the usage experience of my Surface Pro 4 very much. It’s an excellent replacement of traditional notebook: Light in weight with high performance (good enough for writing Excel blog). Also, I like the touch screen and Surface Pen with that I can write on captured screens (to have sort of a personal touch to my illustration, although I know that my handwriting is poor. :P) However, I am afraid that it will be broken in 13 months… even though I know it’s just a random event totally depends on luck. A friend told me that I should buy the extended warranty. For a machine that does not break down in three years, it probably can last for long. He’s got his point, I believe. But one of my considerations, after my Surface Pro 4 broke-down, is “Fixability”. I prefer something that is fixable and can last for long as I don’t want to throw away a machine simply because one of the components went wrong. Another consideration is not about the performance of the machine, but my commitment to this blog. You know what… I felt a bit “emptiness” for not writing anything about Excel in the past few weeks. I know that I am abnormal, sort of. ;p Therefore I am looking into other options such as traditional notebook, which is in most cases more repairing friendly. After browsing and browsing, windows shopping and windows shopping, I have decided to buy a new notebook, which will be arriving in mid September. Coincidently, I will be traveling for leisure for two weeks in mid September. That means, I won’t be able to start writing about Excel until end of September, or early October. Let’s consider it a belated summer break for myself. Did I tell you that besides Excel, I enjoy hiking and taking photos. In retail, it’s very common to compare sales of same day, not same date, of last year. If you are not in retail sector, you may wonder what is the difference between same day and same date of last year. Assume today is 2018/08/11, and same date of last year is 2017/08/11. Very straight forward. But retail people will never compare YoY sales performance in this way. Why? Because it compares apple to orange. Think about this, sales on Saturday (2018/08/11) should be better than Friday (2017/08/11). Make sense? So we want to compare 2018/08/11 to 2017/08/12 instead. It’s a Saturday to Saturday comparison. To load an Excel Table into Power Query is easy. Just click into any cell of the Excel Table, and then click the From Table/Range button (depends on which version you are using, this button resides in different location on the ribbon). This action will take your active Excel Table to the Power Query Editor. To load another Excel table, we need to close the Power Query Editor, go to the Table, then repeat the step. Easy, Piece of cake. To my limited knowledge to Power Query, there is no simple way to load multiple Excel Tables as separate queries in one step. Please correct me if I am wrong. ;p I tried to Google it, but no success. How to change the first letter (of first word only) to upper case in Excel? Is it good to have an Excel “nerd” sitting around you? with Quick Analysis in Excel 2013 or later. Well, what I meant “latest Excel” here are those versions since Excel 2013. Of course, Excel 2016 and of course Excel 365 is getting even better. Needless to say, many people have never clicked the tiny icon that showed up automatically when a range of data is selected.